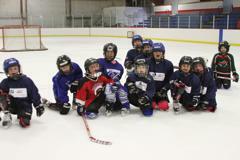 Mora Youth Hockey has developed a learn to skate program that consists of two different segments. The first segment is strictly learning to skate. There are no sticks, pucks or equipment. You'll need to provide skates and gloves, and all skaters must wear a helmet of some kind (hockey, bike, etc.). We have a limited number of helmets that can be borrowed. The second segment is the Mini Mite Program! 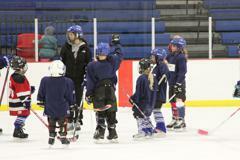 This program is designed for those youngsters interesting in playing hockey. Equipment is provided (with a deposit). How old does my child need to be to sign them up for hockey? Your child must be 4-years-old by December 31, 2018 to be registered for hockey. Where do I get skates? Many families choose to rent hockey or figure skates from places like Lee's Pro Shop in Pine City or Hockey Zone in Waite Park. There is a rental fee (generally around $30-40 for the season) and if your skater outgrows the skates, they can exchange them for a different pair throughout the year. This helps keep costs down for families since kids' feet grow so fast! If you choose not to rent skates, you certainly are welcome to buy them. What kind of skates do we need for L2S? 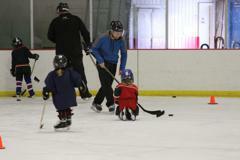 Children can wear hockey or figure skates in the L2S program. 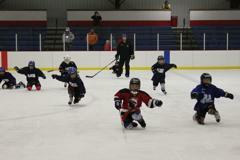 They must transition into hockey skates once mini mites starts, if they chose to play hockey. Can I just sign up for Learn to Skate and decide about hockey later? Absolutely! 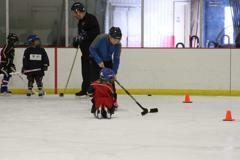 In fact, many kids come to our L2S really unsure about being on the ice. It is common for families to decide a few weeks into it, or at the last minute, that their child would like to continue in the mini mites program. Where do I get equipment? MAYRA offers free equipment rental for our mite players, with a $100 deposit that gets returned at the end of the season when the equipment is returned. MAYRA requires all skaters to provide their own skates, stick, mouth guard, and generally skaters like to have something to hold their hockey socks up (compression shorts with Velcro, garter belt, etc.). MAYRA provides a game jersey and game socks. What kind of stick should I buy? When kids are first starting out, they generally don't know which "hand" they will shoot with, so we recommend buying a stick with a straight blade. Hockey is a little different that some sports, in that there are more right-handed players that shoot left. A basic wooden stick is all they need. How long does the season run? 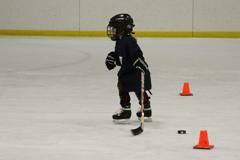 Mini Mites will run December-February. All other mites will begin in Oct/Nov and go through February (possibly the beginning of March). 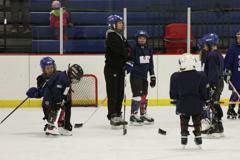 How often and when do mini mites practice and play games? Practice is scheduled on a monthly basis and the days/times vary. Typically mini mites are on the ice 1-3 times a week, but occasionally there are opportunities for them to be on there more. Practice is held both indoors and outdoors (once ice is available outside). We try to keep our practices at earlier time slots for mini mites so they can get to bed at a decent time if they have a weeknight practice. 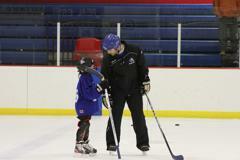 Our goal is to keep travelling to a minimum for our Mini Mite players and families. The schedule usually includes 6-8 games against surrounding communities (Pine City, Hinckley, Princeton, Isanti) and occasionally a game closer to the northern metro. Mini Mites rarely play weeknight games. We occasionally have a Friday night game, but even that is rare. Their games are usually held on Saturdays and Sundays. Do mini mites play in tournaments? 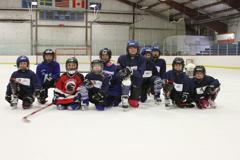 Yes, the mini mites participate in Mora's Old School Jamboree the weekend of January 5-6, 2019. This Jamboree is held outdoors, weather permitting. They do not travel to any other tournaments. New to Skating? Interested in Hockey? MAYRA will be offering some opportunities for our newest skaters to see if they have any interest in joining some of our programs. Try Skating for Free - Come out on October 13 from 12-2 pm, to see if you have interest in skating. This is for beginning skaters and their parents. Our Learn to Skate program starts the next week, so this might be a good time to see if you'd want to continue on into that! Try Hockey for Free - In conjunction with MN Hockey, MAYRA will host "Try Hockey for Free" days on November 10th and February 23! Please check back for more details on those opportunities. USA Hockey "Try Hockey for FREE"
©2019 MAYRA Sports / SportsEngine. All Rights Reserved.